In creating her two-part installation, Autoplast artist Amy Landesberg contemplates our relations to cars, and imagines how an assembly of their parts might take on a life of its own. Using humor and dramatic scale, both artworks transform common car parts into life forms, and model behaviors observed in nature. 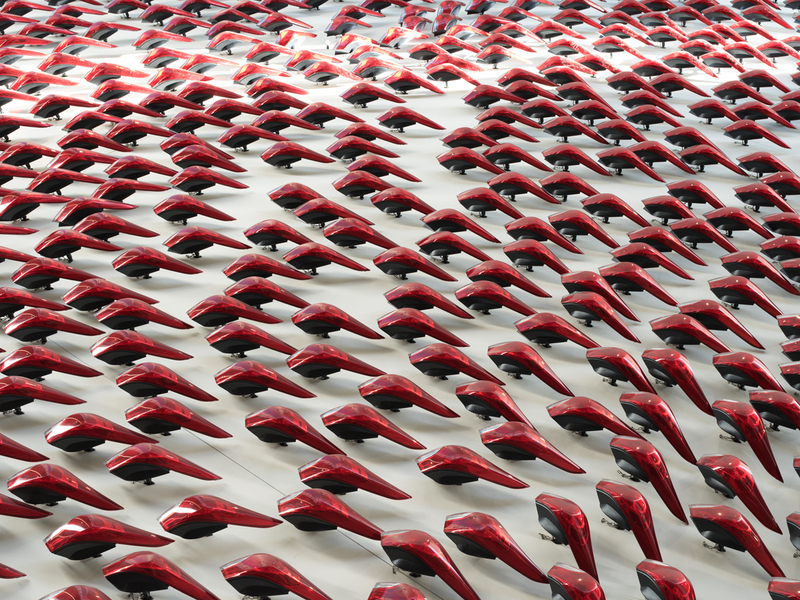 Autoplast I: Tail Light Swarm is comprised of a cloud of vibrant red tail lights that migrate across the expansive vertical space. Inspired by the herding, flocking, or swarming patterns of various specis, the arragement of the lights was designed through a computer simluation intended to micmic the effect of a fine San Diego breeze on a travelling swarm.